Site Facilities: :. Toilets and cafe huts near slip, Parking both sides of harbour but early arrival to get best parking, Air available in the village, plenty of free parking for the boat trailer. 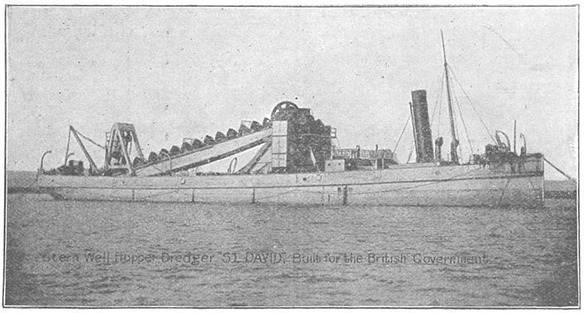 The wreck is an old bucket dredger built in 1894 but was being used as a mine sweeper when she hit a mine on 23rd Sept 1917. She is a 200ft long iron vessel which now lies upside down. There is a pair of enormous boilers right at the front of the wreck. The boilers and engines are at the front of the ship to make room for the dredging machinery further aft. Just off the starboard side of the wreck are a set of enormous gears, part of the drive machinery for the dredge system. The arm and bucket assembly has fallen clear of the hull and is pretty much intact, lying on one side and leading towards the stern. A few buckets before the end of the arm and just out from it, a large pulley block is part of the mechanism used to raise and lower it. The rounded stern of the wreck is only a few metres away lying on its port side. The interior has collapsed leaving just the shell of the stern to swim through where it has broken clear of the twin keels. A single rudder lies resting flat on the seabed. The port keel is completely inverted, and the starboard keel has collapsed towards it. The hull of the St Dunstan would have had a well in the middle for the dredge arm to be lowered, with one keel running either side of the well. The final part of the dredging mechanism is a large winch drum used to raise and lower the dredging arm. This is still tightly packed with cable and on one end there are another pair of big gears which would have driven the winch from one of the main engines. The propeller shaft continues forward along the broken open keel and back inside the wreck, ending in the engine room with a bevel gear. Whereas most steam driven ships would have had no gearbox, with the engine driving directly onto the propeller shaft, on the St Dunstan the main engines would have also been used to power the dredging mechanism, hence the need for elaborate gear systems.